With a minimal investment of time, space, and money, beginning gardeners can enjoy rapid results with a window sill garden. On my 4 inch wide window sills of two, four foot (double paned) windows that face south, I was able to fit six plastic six- pack planters each (twelve packs total, 72 plant holes). Once the first seeds sprouted, I added two tables in front of each window to hold deeper pots for the biggest plants while reusing the six-packs for new seeds. I also hung two pots from curtain rods. Below are my notes on the fastest, easiest and most robust ones that grew on my window sill from March 10 through the end of April 2013. Cosmos is an easy annual flower to start indoors or outdoors in Alaska. It looks like a daisy, but with a broader range of colors. It has lacy foliage, and can grow up to three feet tall. Started indoors on March 10, cosmos was the star of my window sill garden. Every seed germinated within a few days, faster than any other. The plants grew rapidly, to 4-12 inches tall with lots of leaves within six weeks. The seeds can be planted directly in the garden too (after frost), and will bloom early summer to frost. Best of all, cosmos prefers to be neglected. Too much care once they are established can inhibit the flowers! What’s not to like? Nasturtiums are a wonderful flower for Alaska. They come in climbing, trailing, and bushy varieties and have a rather tropical look to the flowers, which bloom for about ten weeks. They are recommended companion plants for certain vegetables, like cabbage. Every part is edible, too! These are particularly good seeds for children because they are large enough to handle, about the size of a green pea. Nasturtiums require two special treatments to start but after that, they are among the easiest to grow. (1) The seed pods are hard, so to speed up germination, SOAK them overnight before planting. Then, they require DARKNESS to germinate. I simply put the first six pack of seeds beneath a table and the second one I tented under tin foil. Three seeds sprouted and yielded healthy, handsome plants. By six weeks, all of these had four attractive leaves and were becoming root bound in the little seed pack so I transplanted them into a hanging pot. A week later, each was a healthy 6-8 inches long, leaning toward the sun. The other three seeds were still hard, so I soaked them again and replanted them the next day, but they still had not sprouted eight days later. Maybe duds. So I soaked another set. After danger of frost, I’ll hang the pot outside for a profusion of six foot trailing orange and yellow flowers. How lovely. 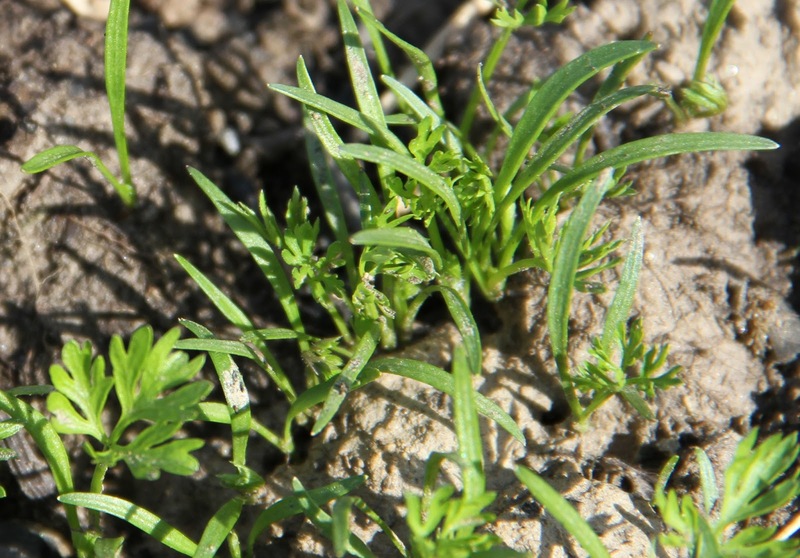 Many herbs have teeny, tiny seeds which may be better handled by adults than children. Basil seeds will sprout faster if you soak the tiny seeds first, on a damp paper towel or napkin for 6-8 hours. With this treatment, of all the herbs, the basil plants sprouted fastest, within a week. Within six weeks, I had several small plants with 4-6 glossy leaves each and that delicious scent. Note: don’t let this plant dry out and don’t let it get cold. It will stay in the greenhouse this summer. Basil seedlings are easily distinguishable. Photo by Heidi Rader. All of the cilantro planted on March 28, 2013 sprouted and grew rapidly. The familiar looking true leaves started to appear three weeks later. Before that, the sprouts looked like grass and I wasn’t sure I had labeled them correctly! Nearly a month later, on April 24, 2013, some of the plants were becoming root bound (Cilantro has a long tap root). I transplanted half of them to a large, deep, circular pot and left the rest in the little six pack until I monitor the transplants. Both fared well in their respective locations but I need to rummage up another pot. Cilantro is cool tolerant, so I occasionally put the pot out in the sun in the middle of the day, when the temperature is in the mid-40s, perhaps higher in the sun. This will remain in a pot outside. Anise hyssop seeds require a cold start. So I just put the packet of seeds outside for several days (temperatures 0-+20). All sprouted and put out many side leaves quickly. These plants will be transplanted into the garden, where they will grow to 2-4 feet tall, with leaves that taste like licorice, topped by a lovely thin, spike of purple/blue flowers (other hyssop variants range from yellow to red). They make a good border plant in full sun. The early leaves looked much rounder and more pinked (as if trimmed with pinking shears) than the long sharp leaves I expected. I didn’t recognize the seedlings except by the taste of the leaves. Leaf lettuce that we planted on March 10, 2013 we started to harvest in mid-April. The leaves didn’t really look like traditional wavy leaves of lettuce until after the first cuttings prompted additional growth. To be frank, the type I planted didn’t have much flavor or even much texture, but it was satisfying to eat something fresh so quickly, and my meat rabbits love it. Broccoli and cucumber planted on April 17, 2013 germinated much more rapidly than I expected, within three days! Cabbage followed a day later. How fun is that! Each is an interesting looking sprout, easy to distinguish from one another. Cucumber seeds are a good choice for children because they are large enough to see and recognizable as those seen in the mature vegetable. Carrot seeds are so tiny that I didn’t try to parse them out among the six packs but just started in a deep pot. You just sprinkle them on top of soil and then spritz water over them until they sprout. This took about a week. All of a sudden, the pot looked like it had a thin field of grass. Once the sprouts get to be 2” tall, you thin them, eating the intervening sprouts. Temperature: My home is a bush cabin that is heated by a woodstove. Interior temperatures are variable, reaching lows of 53 degrees at night and an occasional high of 69 during the day. If your temperatures fall in a narrower range, I imagine that your results may be even better than mine. Light: I relied solely on natural light. My southern windows do not provide full sun exposure all day because of several tall birch and spruce trees which provide partial shade at various times of day. Over the months of March and April, we had one uninterrupted 10 days of sunshine, but also three periods 3-5 days each of snow fall and multiple days of overcast but bright days. 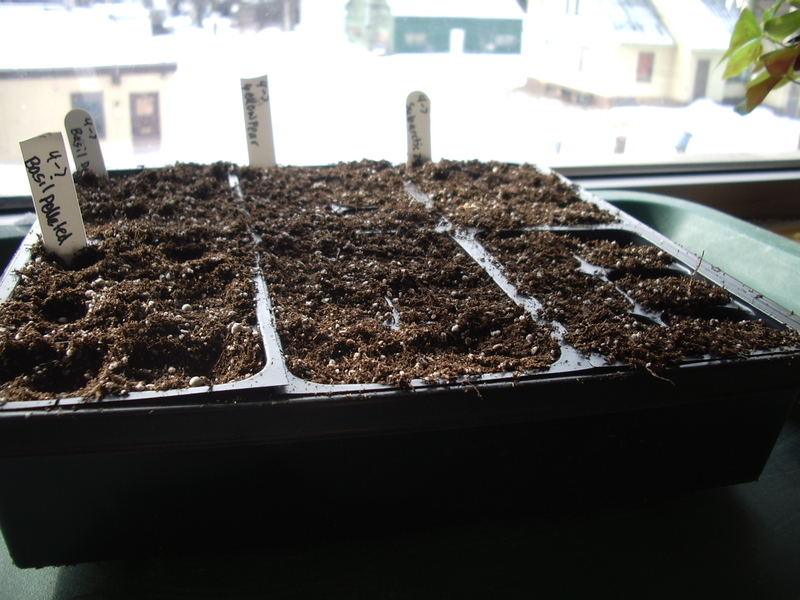 Supplies: The soil in which I planted the seeds was a combination of Miracle Gro and Perlite. A packet of seeds cost between $1-2.50, depending on the plant. I bought my seeds from Denali Seed Company in Anchorage and Pine Tree Seeds (in VT). Don’t overwater: The single greatest cause of potted plant death is overwatering. Recommendation: use a spray bottle to keep the soil moist before the seed emerges, and then for the little sprout. Don’t water deeply until a bit later in plant development. Start easy seeds if you are a beginner: For beginners, the most satisfying seeds are those that sprout fastest, so read the labels of plant packets. Although some of my seeds never grew at all, most sprouted at or earlier than the seed label said. The fastest sprouters for me were cosmos, broccoli, cucumber, and cabbage. The fastest growers were cosmos(8-12” in six weeks) and nasturtium (up to 8 inches in 4 weeks) and anise hyssop plants which had as many as ten leaves on small plants within 4 weeks. Large seeds are easier to for children to handle: Among my list, moonflower, nasturtium and cucumber seeds are the biggest (but only one of six moonflower seeds sprouted for me). 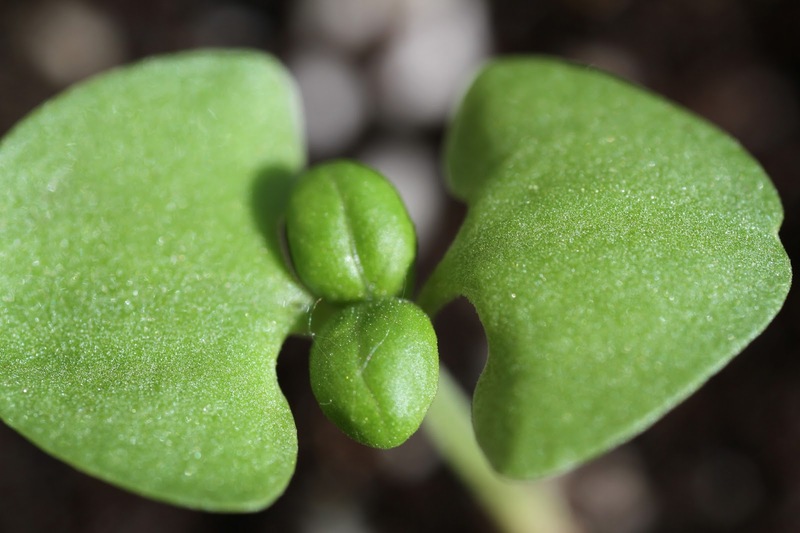 Label your seeds: Started from seed, you may not recognize the young plants at first, as the initial leaves don’t look like the “true” leaves you see in store bought plants. So LABEL them with popsicle sticks or something. From this window sill experiment done over 7 weeks, I learned how easy it is to grow seedlings indoors, even in less than optimal sunshine and temperature control. I experimented with some that required darkness, cold starts, soaking. Overall, a much higher percentage of seeds sprouted than I expected, and several of the plants grew faster or became root bound faster than I anticipated. It was very satisfying! Since this spring is exceptionally cool and snowy (As I write this May 3, I have snow for the third day in a row), I am unable to transplant them outdoors or in the greenhouse as early as I expected, so I wish I had more medium sized pots. Overall, I thoroughly recommend window sill gardening for even the smallest home or classroom window. For more Information on Seed Starting. . .
What I'd like to know is, what can be successfully COMPLETELY grown in a windowsill? We have too many moose around to grow outside? As long as you can provide a big enough pot for your plants, and you have adequate sunlight coming through your window, you should be able to raise just about anything you can grow outside in Alaska, inside in Alaska. However, cold season varieties such as spinach, lettuce, broccoli and cauliflower just to name a few may have a greater tendency to bolt inside in the summer if it is too warm. Tomatoes and cucumbers would probably do well if you can maintain a greenhouse like environment.